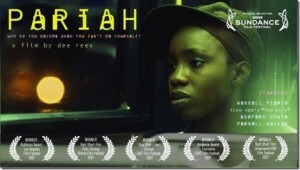 Pariah, by its definition, is a social outcast. This film gives the viewer and insight into the world of an African American teenager in New York City who is struggling with her sexuality. “Li”, the protagonist of this film, hides the fact that she is a lesbian from her parents while simultaneously trying to learn how to exist in a society where she can be accepted for being herself, but still realizing that she is generally shunned by the public. This is at least what this film is like on the surface, and that stated, it accomplishes its goal. The protagonist, “Li,” or “Alika,” played by relative new comer Adepero Oduye, gives a touching and sympathetic look into the struggles of a black lesbian in the Bronx. But the beauty of the film is not found in the fact that it takes on the story of an underrepresented class. Rather, what I found to be so compelling is that it gives the story of a girl that perhaps the general audience will not be able to relate with superficially, but uses this character as a vessel to remind us of all the personal struggles that we dealt with in our teen years. The issues dealt with by our characters are the same that most Americans will remember from our childhood. Our search for identity, our desire for acceptance by our parents, seeking to find a place in society, and our ultimate self-realization that brings us to the persons that we are today. Every aspect of this film was beautiful, the acting felt human, the characters relatable, and the film itself was touching and gently humorous, reminding us that in each of our personal struggles, there are moments of warmth that will always make us smile. I commend director Dee Rees for using a unique experience to remind us all of our human condition. Instead of focusing on overdramatized angst or overt social stereotypes, we are all just reminded of what it was to be a kid trying to find themselves. This entry was posted on Friday, December 30th, 2011 at 12:32 pm	and is filed under Film. You can follow any responses to this entry through the RSS 2.0 feed. You can skip to the end and leave a response. Pinging is currently not allowed. « There Will Be A Full Series Marathon of ‘Walking Dead’ on New Years Eve!! !